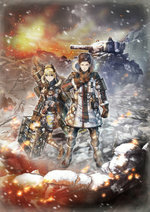 Valkyria Chronicles is widely considered to be a return to form for the (very) alternate history strategy series set in a re-imagined World War II. It won hearts and minds with its first game a decade or so ago, but fans have been less happy with subsequent iterations. The most recent, Valkyria Revolution, swerved into action RPG territory and fans have been clamouring for the real time strategy that they fell in love with. Valkyria Chronicles 4 delivers it in spades returning to the series' roots, backed by the current generation of hardware and a few new tricks for the old dog. It's the year 1935 EC. Europa is burning as the Second European War rages, with the forces of the Atlantic Federation and the Autocratic Eastern Imperial Alliance raining holy fire on each other. As things look more and more desperate for the Federation, they launch a last ditch attempt to capture the imperial capital dubbed Operation Northern Cross. Up to their necks in the fight are Commander Claude Wallace and his loyal childhood friends in Squad E. Not only must they survive bone-chilling cold, wave after wave of imperial soldiers and the terrifying Valkyria, they will also unearth a grave truth that threatens to consume them. It plays out through the BLiTZ battle system - part overhead turn-based strategy, part RPG, part third-person shooter. In the mix is a new class called the grenadier, various offensive and defensive battleship support options and the chance to give a unit a 'Last Stand' before it's destroyed. It's all presented in the Valkyria series' trademark sepia-infused watercolour art style. Imagine stepping into an interactive painting of an alternative version of 20th century Europe and you're about there, but don't forget to add plenty of gutsy combat and explosions!